A practical, full day (8:00am - 4:00pm) workshop which includes real-life scenarios geared specifically toward the Workers’ Comp claims adjuster. Adjusters use their own issues and barriers in problem solving exercises to focus on result oriented activities. Students leave with some very practical methods of improving time management, which they can put into place right away, as well as some methods that require management support and involvement. Customer service is strongly emphasized throughout the day. A full day (8:00am - 4:00pm) workshop for any level of Workers’ Comp claims professional. Most Workers’ Comp claims people know the customer rarely recognizes outstanding customer service during the claims process. Because of this, it is extremely important for claims professionals to be able to recognize and deliver outstanding customer service without the acknowledgement of the customer along the way. In this course, participants will understand the basics of providing high quality customer service, learn proper telephone techniques, gain insight into understanding what individual customers need, manage the customer’s perception, as well as understand the essential role customer service plays in the success of the claims department. 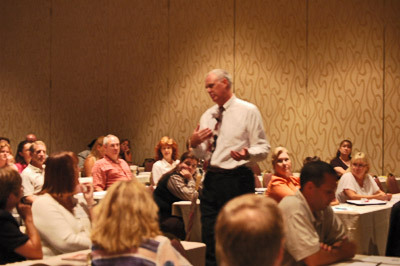 Some specific topics include: handling the telephone; effective listening; managing objections; asking questions; delivering bad news; managing different customer behaviors; managing the voice mail system; managing customer call backs; statements to avoid; closing conversations; attitude as the key to success; and an action plan for better service. A full or half day workshop designed to help Workers’ Comp adjusters develop the ability to write clear, concise business letters, memos, file notes and reports. This includes the “do’s and don’ts” that will help make communication more persuasive. The elements to well-written sentences and organized thoughts are covered in detail. This is especially important in the workers’ comp adjuster position since quite often it is the adjuster’s letter that is used as a tool in the developing stages of claims handling. The goal of this workshop is to enhance the level of business writing for the adjuster in the areas of professionalism and persuasiveness. A full day (8:00am - 4:00pm) workshop designed especially for the Workers’ Comp claims adjuster. Staying effective during unpleasant situations is the hallmark of the most successful adjusters. The main objectives of this course are to explain the psychology that governs upset customer behavior, suggest steps to take after the customer is gone, present strategies for successful customer encounters, and advise adjusters about their actions and attitudes. Upon the completion of the course, adjusters will have learned: why it’s important to calm upset customers; why we sometimes want customers to complain; things we can learn from upset customers; why customers become upset (not the obvious, such as low offers); what we can do to avoid customers getting upset; how the words we use make a difference; what the upset customer wants; how to diffuse defensiveness; and what to do after the encounter is over. A 1/2 day seminar designed specifically for the new claims adjuster that might be experiencing high levels of anxiety due to the stress and pressures of the claims adjuster position. Scenarios, exercises and role-play help develop ways of increasing self-confidence, resolving anger, as well as understanding, evaluating and reducing anxiety. This course will also help adjusters learn how to manage their frustration as well as the frustration of others. Through focusing on the causes and effects of anger, adjusters learn to modify their behavior and their reactions, thereby increasing efficiency and customer service while enhancing job satisfaction. A full day (8:00am - 4:00pm) workshop designed specifically for the Worker’s Comp claims adjuster. This course teaches what makes people become difficult to deal with in the first place and how to avoid it. Discussion then turns to how to alleviate tense situations and gain cooperation out of people. A full day (8:00am - 4:00pm) workshop designed specifically for the Worker’s Comp claims adjuster. Stress is a normal part of any Workers’ Comp adjuster’s day. However, it is how one manages that stress that can mean the difference between being comfortable with it or falling prey to it. This course outlines a way to look at stress as, although a normal part of the job, something that can be controlled and allievated. Self created stress is a big part of that. Students learn what they are doing to create stress upon themselves, and how to reduce that self created stress.